We welcome all gifts to Our Lady Queen of Peace Parish, whether it’s your time and talent, a monetary gift, or prayer for parishioners in need and for the success of QP ministries. Here are just a few of the ways our parishioners give. Please pray about the ways God is calling you to serve. Here are some of our most needed volunteers. Take a look and let QP know how you can give back. Hospitality Weekends: On the weekend of the third Sunday of each month, serve refreshments after a Saturday evening or Sunday morning Mass. 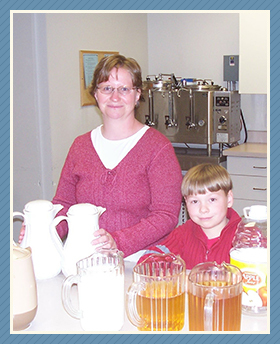 This is a natural way to volunteer as a family and welcome others to our parish. Visit our QP Community Enrichment page for more information. Home Communion: Extraordinary Ministers of Holy Communion bring this Sacrament to sick and home- or care center-bound parishioners each Sunday after the 8:00 a.m. Mass. Volunteers sometimes pair with a friend in this ministry, and we also welcome parents with grade school-aged children to serve and bring their children along. Visit our Pastoral Care page for more information. Meal Program Food Providers: Purchase or make food items and bring to the Parish Center for any of the three free meals served to the poor. Visit our Social Action page for more information. Prayer: Participate in Eucharistic Adoration on Tuesdays in the Chapel or prayer for anonymous needs of parishioners by joining the QP Prayer Network. Parish financial stewardship is a responsibility shared by all members. Please pray about your Offertory giving and remember that what matters is not the amount you can afford but to share generously, in joy, some of what the Lord has given you in blessings. Give Parish Support (Offertory): Weekly Offertory gifts provide the funds required to maintain and cover parish expenses of serving over 8,000 members seven days a week. You can schedule automatic Offertory donations online. Give Memorial & Honorary Gifts: Give a gift in honor or memory of a loved one or friend. Give to the School Endowment Fund: This fund supports the many costs to educate the nearly 500 students in QP School, including financial need-based tuition grants to those who cannot fully afford a Catholic education. We only use the earnings on Endowment contributions, so your gift grows even as it gives! For more information about the Endowment Fund, contact Kate Ripple at (608) 231.4600. Give to the QP School Endowment now, one time or regularly. Donate Stock, a Planned Gift, or Bequest: Gifts to the Parish or School Endowment often result in tax savings to you or your family and can allow QP to meet large expenses or fulfill long-range plans. Consult with the parish or school to designate a special purpose for your donation. To discuss possibilities, contact Bri Patten at (608) 231.4600.